Representatives from the Thai side told His Holiness they were proposing to hold a two day conference in Bodhgaya in February 2019 on Engaged Buddhism. The aim would be to explore how Buddhist wisdom and advice can be more accessible to the general public in the 21st century. 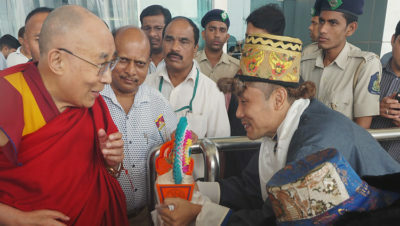 His Holiness gave his encouragement and support. In a separate conversation with Nobel Peace Laureate, Kailash Satyarthi, His Holiness talked about how he is committed to trying to revive ancient Indian knowledge in contemporary India. Satyarthi told His Holiness that he believes anger, in the sense of righteous indignation about injustice, can be a positive source of energy. 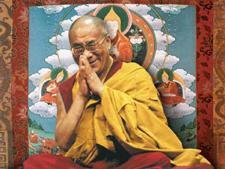 His Holiness replied that anger may indeed unleash energy, but it tends to be blind and unfocussed. However, he did concede that there is such a thing as forceful compassion. In the context of proposals to celebrate the 150th anniversary of Mahatma Gandhi’s birth His Holiness agreed that India should take a lead in presenting ahimsa—non-violence to the world. He remarked that at the time of the freedom struggle there were those who dismissed non-violence as a sign of weakness, whereas today more and more people appreciate that it is actually a sign of strength. He clarified that the motivating factor should be karuna or compassion, while the action and conduct that springs from it is ahimsa or non-violence. Satyarthi told His Holiness he was interested in how to make karuna into a social movement.